The third piece in Recycled Minds' Voices of Occupy series is written by Cyrus Kleege, who has been participating in and following the critical narrative of Occupy Wall Street. Kleege is a professional book clerk, amateur writer and activist living in Brooklyn. You can read more of his writings at Occasional Vitriol and Rich Jerk Quote of the Week. A massive set of protests has been planned for November 17th in New York City. It remains to be seen whether they will evidence strong, continuing support for the Occupy movement. In recent weeks it seems that those who wish for the failure of the movement have been taking the proverbial gloves off, with more harsh police tactics in evidence as several cities (St. Louis, Burlington, Salt Lake City, Portland and others) have attempted to evict Occupy encampments from public spaces. The intense antagonism toward the movement is the inevitable result of its success in mobilizing massive numbers of people around progressive causes and capturing the media spotlight that was so reluctant to shine on it in the beginning. If the forces of reaction are successful in driving the movement out of the public squares, it will still have done much to energize the left in America and should leave it in a stronger position to win battles on policy and shift the nation's consciousness in a progressive direction. The reason for this is an aspect of OWS that seems obvious, but hasn't been discussed much in the media. Occupy Wall Street has become (perhaps unintentionally) the best vehicle for what I'd call “radical networking” (you can call it movement-building if you really want to avoid the business school connotations of the former). OWS, with its lack of demands (actually, the important thing is that it has many) and its sharing of decision making between individuals and between multiple nodes of activity brings together causes that might have seemed distinct in the past, and allows them to coalesce into an umbrella movement that's greater than the sum of its parts. I'll give you an example from my own experience. A few weeks ago, wanting to do more than march in general support of OWS, I joined one of its many autonomous “working groups” who meet outside of Zuccotti Park and attempt to use the same horizontal decision making process that the General Assembly does to come to agreement about issues that fall under the purview of their particular group's focus. I am a union shop steward at my workplace and feel strongly that organized labor is a powerful and positive social force that can be credited with much of the progress that occurred in American social relations in the twentieth century. I hoped that organized labor might be able to bring to bear some of its institutional resources in service of the Occupy cause, and that Occupy's freshness and energy might play some part in re-vitalizing the state of organized labor. Days before I signed up for the Labor Outreach Committee, my union (The United Auto Workers) officially endorsed Occupy Wall Street. When New York City's Mayor Mike Bloomberg had tried to clear Zuccotti Park on the pretext of a cleaning of the area, members of my union, both rank-and-file and paid officials of the international went to the park in the wee hours of morning to stand down the NYPD. I was exceedingly proud. The OWS Labor Outreach Committee is dedicated to getting more rank-and-file union workers involved with the Occupy movement and using the momentum of OWS to aid organized labor in its varied battles. Occupy supporters, some union members and some simply sympathetic to the struggles of working class people, have joined picket lines in support of locked-out Teamsters at the Sotheby's auction house and demonstrations for Communications and Electrical workers fighting to get a decent contract out of Verizon. It seemed that my hopes had been realized when a week ago the New York Times ran a story under the headline, “Occupy Movement Inspires Unions to Embrace Bold Tactics.” Labor has been on the retreat for decades. It has lost members to outsourcing as well as to legislative attacks. At the same time it has lost the sympathy of many who would benefit from its power as they accept fear-mongering pro-business propaganda as gospel. (I'll be surprised if I don't get at least one hateful comment after revealing that I am one of those scary 'union thugs') With Occupy Wall Street entering the picture it seems like there is finally a chance that the momentum will be in the other direction. Because OWS isn't solely focused on one issue it can marshal the energies, talents and enthusiasm of all its supporters in service of all of the more narrow progressive causes that others have fought for for years. Since OWS has focused on issues of economic inequality and class power it has avoided the single-issue tunnel vision that has hamstrung the left for decades. Since the ascendancy of the post-1960's right-wing in America, the left has generally seemed willing to give much ground on the broad issue of economic justice and has instead focused on an array of secondary problems. Without the recognition that all of these problems relate directly to the way in which economic power is distributed in society, the left allowed itself to become balkanized into multiple, often mutually hostile groups dedicated to their own pet issue or brand of identity politics. 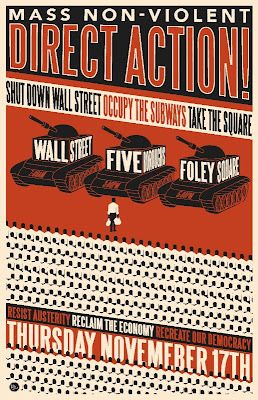 Occupy Wall Street seems to me to be ushering in a new era of radical networking, welcoming all of those who fight against one or another of the ill-effects of economic injustice, the corporate power that thrives on it and the political corruption bred by it. It facilitates their ability to act in a concert with each other. Each specific cause gives purpose and focus to the movement as a whole, and the movement as a whole lends power to each of its parts. Unions who lend their support will gain allies in their workplace struggles, while they lend support to those opposing Hydraulic Fracturing in the Marcellus Shale, who will fight against unfair foreclosures and the corporate “reform” of the public school system. 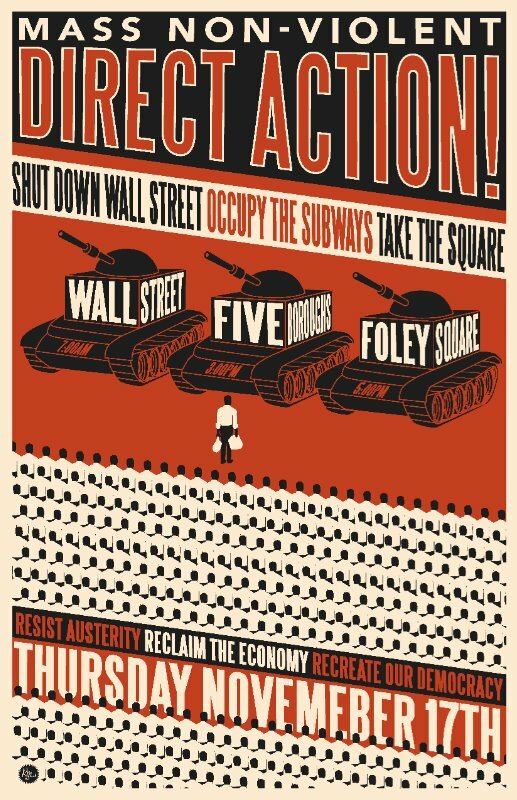 I think that this is a great thing, and hope that the Occupy Movement can maintain its momentum. If you're near NYC, come out Thursday and be a part of it. I wonder how the latest evictions from the park will affect this event on the 17th and the long-term future of the movement? Its funny. Literally as I was emailing this blog to R.M. I started getting messages in my inbox that the eviction was occurring. I was there last night though and there were 800-1000 people back in the park. I think it will end up being occupied essentially in shifts, without the electronics and tents.